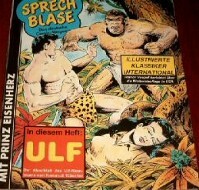 Die Sprechblase from Hethke Verlag. German. Hethke Verlag did publish this magazine up to today. Prince Valiant did appear in a lot of numbers. It is interesting that they did publish material what is only a few years old and never published anywhere else. For example, Carlsen Verlag, which is the company which is most up to date with there pages in comic form (volume 70 include the pages 3092-3134; from 1999) is still not arrived at the pages published in Die Sprechblase. Value around 7 euro for each magazine. Below is a list of recent Sprechblase numbers and Sunday pages. Number 3180 is a Sunday page from 1998. These numbers can still be obtained with Hethke Verlag, see links page.